Clearly I’m having a thing for sneakers right now! Nearly every roundup I’ve done over the past month has included a chic pair of sneaks. But honestly, what’s not to love? This week I’m crushing on these Nike metallic silver sneakers! They’re a cool upgrade from your workout pair, not to mention they’ll dress up your go-to athleisure looks for errands and casual outings. Working from home definitely has its perks, and a big one is being able to dress more casually and wear items like these sneakers on the reg! This swivel chair looks so comfortable, and I love the subtle herringbone-weave fabric. This floor mirror is way out of my price range, but I’m head over heels for it. Such a gorgeous color combo! This antique mirror is a much better price – would love something similar (but perhaps a little less ornate) for my master bedroom! I’m actually pretty picky when it comes to chandeliers, but I really dig this one. It’s got a great rustic vibe that would jive well with my neutral color scheme. We’re still working on my dining room, but I love the silhouette of these chairs. As far as art goes, I’m hoping my sister will paint something for me! I love abstract pieces, and actually fell in love with some paintings hanging in Cafe No Se in Austin a couple weeks back. I’m currently trying to track down the name of the artist! PS – have you been by THE SHOP lately? I just added a brand new category and updated the others with a bunch of gorgeous new arrivals! love the metallic sneakers, I was so tempted by the rose gold pair. Beautiful edit! I’m seriously loving that bracelet, and sunglasses. 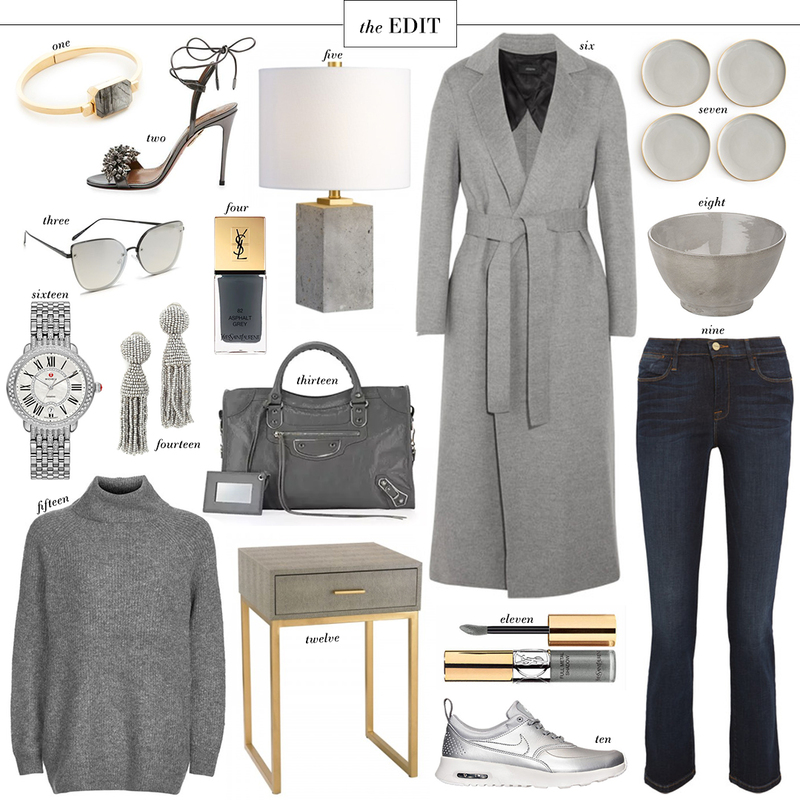 Grey is definitely the best colour/shade in the world – love this collection, especially that coat! the neck of that sweater is perfect!